We found ourselves in Hackney last Sunday afternoon, in search of a quick bite, before heading to Hackney Picturehouse cinema. 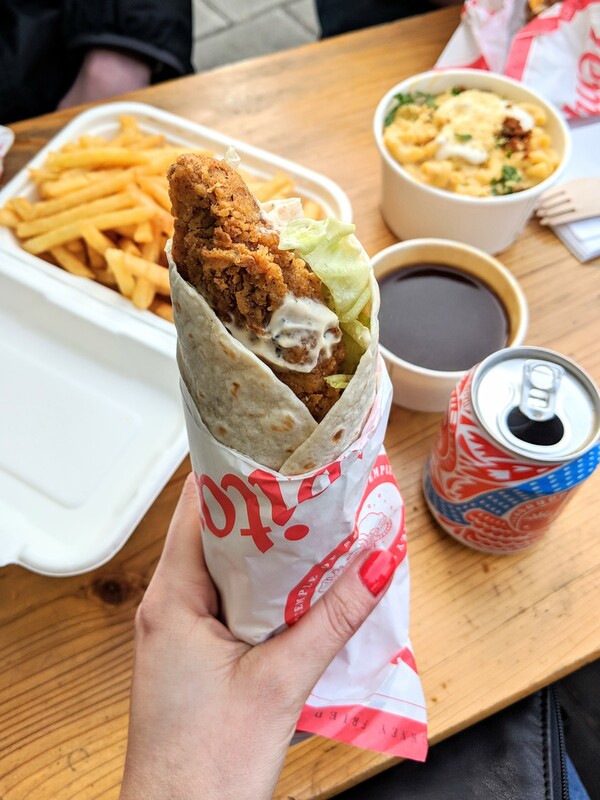 We decided to take a look at Temple of Seitan – a vegan fast food takeaway. With a permanent queue outside the door, it’s hard not to spot. 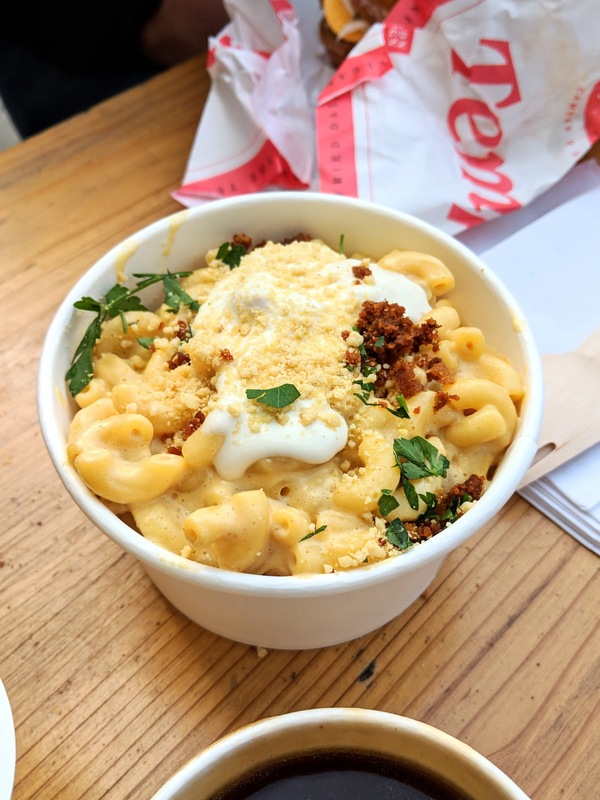 Being a dry, fairly mild day, people were lining the street, tucking into vegan fried ‘chicken’ and vegan mac n cheese. Keen to see what all the fuss was about, and absolutely starving, we decided to try pretty much everything on the menu! Between the three of us, we covered the Temple Spicy Burger (fillet, chipotle mayo, coleslaw, cheese, jalapenos & sriracha), Twist Wrap (two strips, lettuce, tomato, lemon pepper mayo), Popcorn Bites, Fries (with chicken salt), Mac ‘N Cheese, Gravy and Chipotle Mayo. Not bad eh? Looks wise, it’s no different than any other chicken takeout. The décor is the same – no fuss, no frills. Even the food looks no different to any other chicken takeaway or KFC. The fillet burger, twist wraps and popcorn bites, look scarily identical to their real chicken counterparts. It actually kinda freaked me out a little. The wrap got a big thumbs up from – reminded me of KFC’s chicken twister. As did the popcorn chicken, although I have to say, the texture is very different to that of real chicken, but obviously that’s a good thing for any vegan I’m sure. The mac ‘n cheese started off as a favourite, but very quickly became too sickly for me. The cheese just didn’t quite taste right, and personally I would still rather a real cheese version. BUT I love the idea and love the fact no animals were harmed for my meal! I’m not vegan, but even if I was, I’m probably not their best customer, as I don’t like fast food. 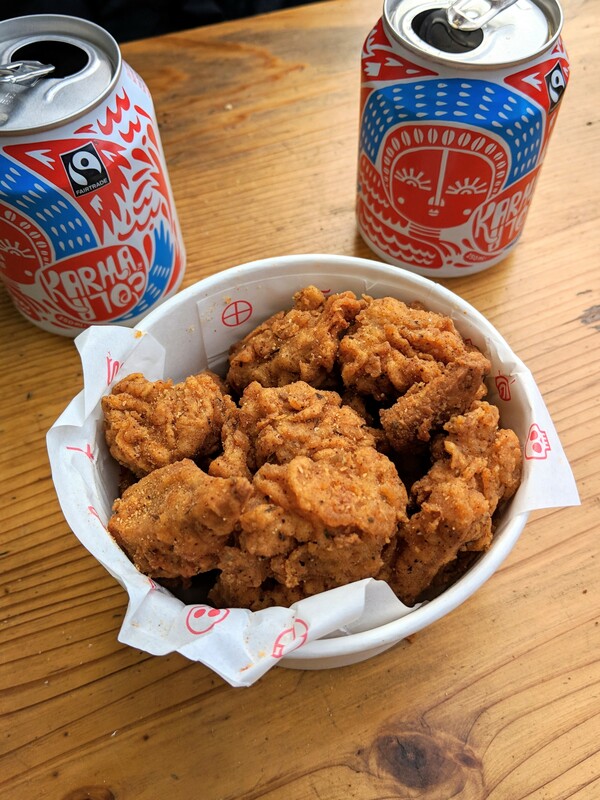 I have to be very hungover to ever want a burger or fried chicken, and personally I don’t know why a vegan would want to eat something that resembles real chicken so well. But as I said above, I love that no animals were harmed and I love that this exists, giving veganism a new dimension. I probably wouldn’t hurry back, but as I said, I wouldn’t hurry to any fried chicken takeaway. Really keen to try by. Chloe for healthier lentil and quinoa inspired burgers though! Hi! I'm Kim, writer of sweetmonday.co.uk. 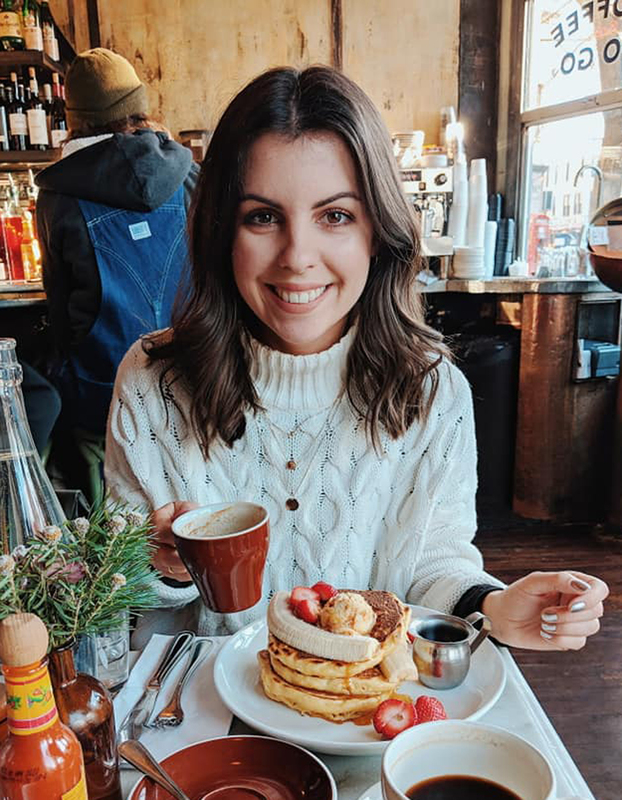 I enjoy cooking, eating out, travelling and exploring the city I call home - London. Follow me for recipe inspiration and my top tips for travelling.